One Dance for Case is already one year old! WOW! I thought what a better way to celebrate than a fresh cover and a giveaway! Of course it's still featuring David Juteau & Photographed by the wonderful Paul Henry Serres! Then #claim your copy here! There's only 100 copies up for grabs, so make sure you're quick! Sergeant Casey John Risley: amputee, war Veteran, recovering alcoholic. Jealousy consumes him. Bitterness leaves him pushing everyone he loves away. 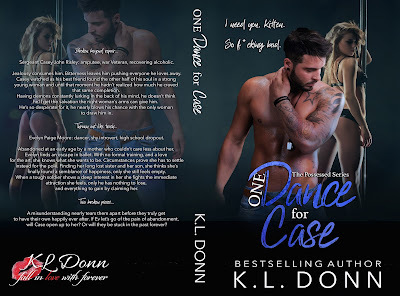 Casey watched as his best friend found the other half of his soul in a strong young woman and until that moment he hadn’t realized how much he craved that same completion. Having demons constantly lurking in the back of his mind, he doesn’t think he’ll get the salvation the right woman’s arms can give him. He’s so desperate for it, he nearly blows his chance with the only woman to draw him in. Evelyn Paige Moore: dancer, shy introvert, high school dropout. Abandoned at an early age by a mother who couldn’t care less about her, Evelyn finds an escape in ballet. With no formal training, and a love for the art, she knows what she wants to be. Circumstances prove she has to settle instead for the pole. Finding her long lost sister and her son, she thinks she’s finally found a semblance of happiness, only she still feels empty. When a tough soldier shows a deep interest in her she fights the immediate attraction she feels, only he has nothing to lose, and everything to gain by claiming her. A misunderstanding nearly tears them apart before they truly get to have their own happily ever after. If Ev let’s go of the pain of abandonment, will Case open up to her? Or will they be stuck in the past forever?